Wearing unique jewelry is very popular among little ladies. Crafting their own jewelry is an exciting and joyous experience for the adolescents. If you want to make jewelry for children, you do not need to spend on expensive craft accessories or spend a lot of time. Original pieces of jewelry can be created with a little creativity and imagination from the simplest materials. 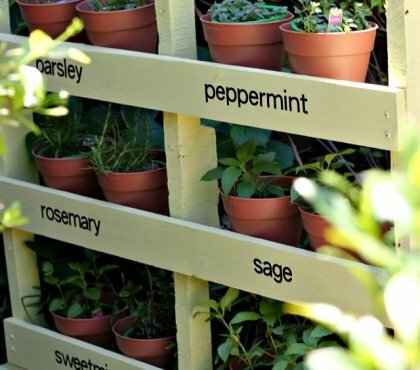 Here are 11 DIY Jewelry craft ideas for kids which are also a great activity for vacation days. 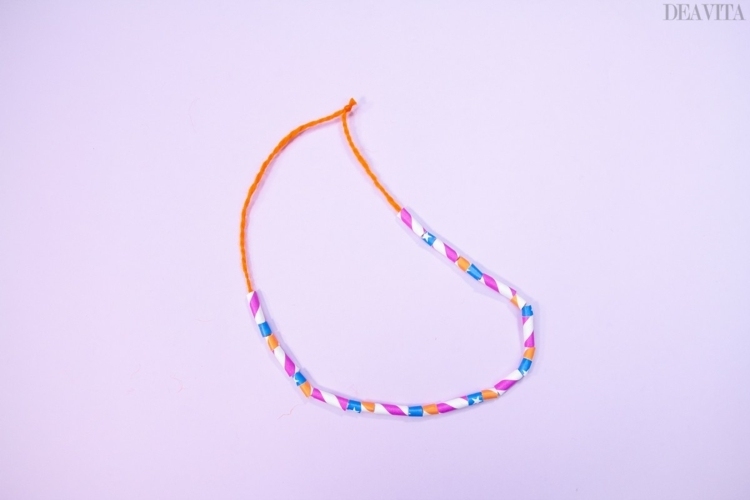 This pretty bracelet is made of simple materials in no time and is a real eye-catcher. Arrange the paper clips in a chain. 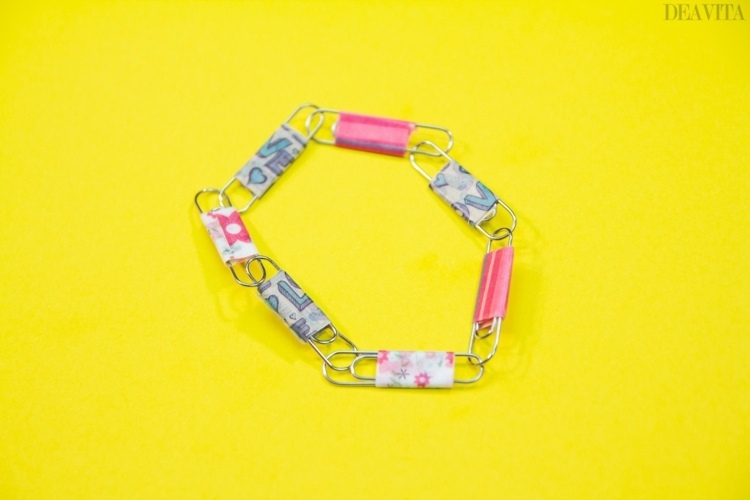 Wrap each paperclip with a little washi tape and you will have a great jewelry piece for kids. 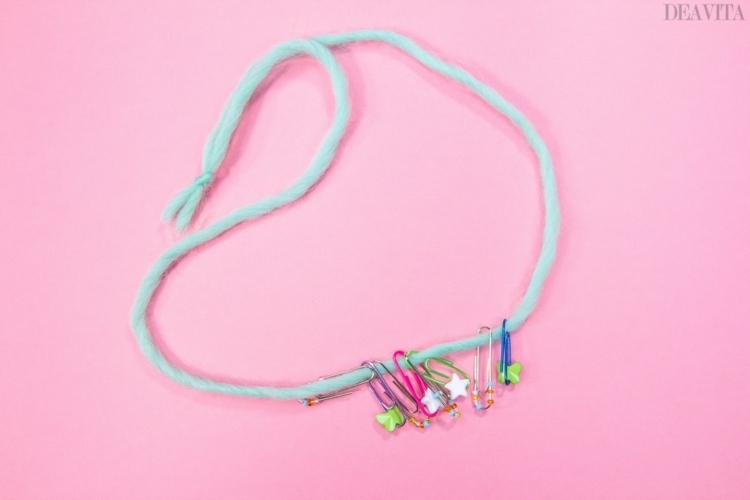 You can make a charming, colorful necklace for your little girl from colorful buttons in different shapes and sizes and paper clips. Thread a paper clip through the hole of a button and then attach another button to it. Repeat the process, until you reach the desired length of chain. 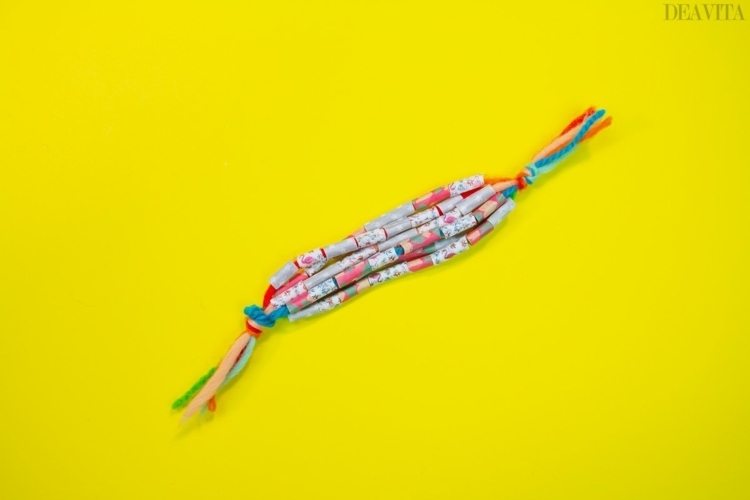 An attractive and slightly more opulent bracelet for a young fashionista can be made from patterned straws and washi tape. Making original jewelry for children, is really easy and makes children and adults happy so get the kids involved in crafting! 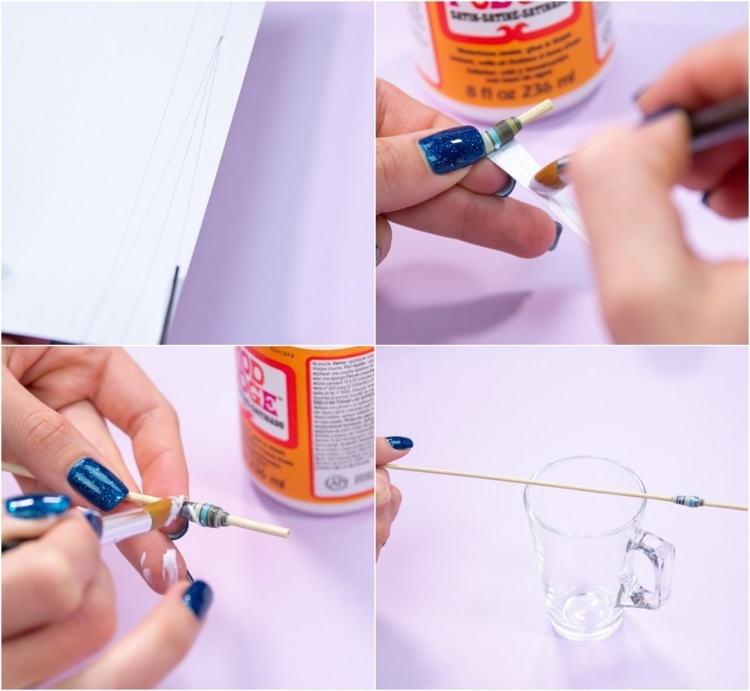 Glue with Washi Tape in different colors to the straws. 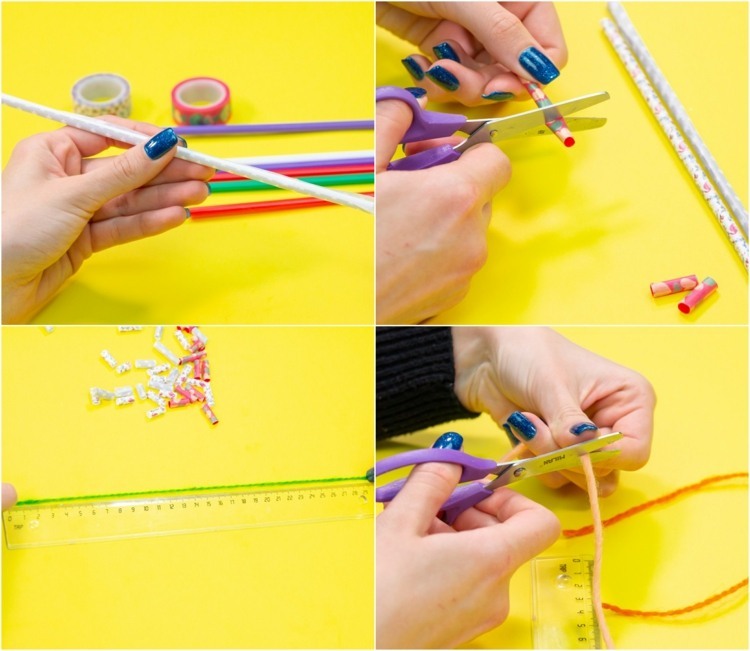 Cut the colorful straws into pieces of various sizes. Cut off 6 pieces of yarn with a length of about 30 cm each. Thread the small tubes to the yarn. Tie the individual chains together at both ends. 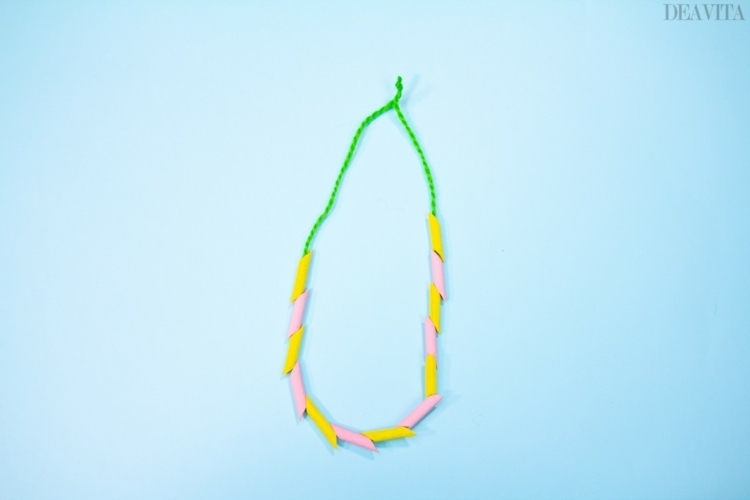 Our next suggestion for colorful children’s jewelry is this charming necklace with pendants made of paper clips and beads. Take a paperclip and thread in a few seed beads. 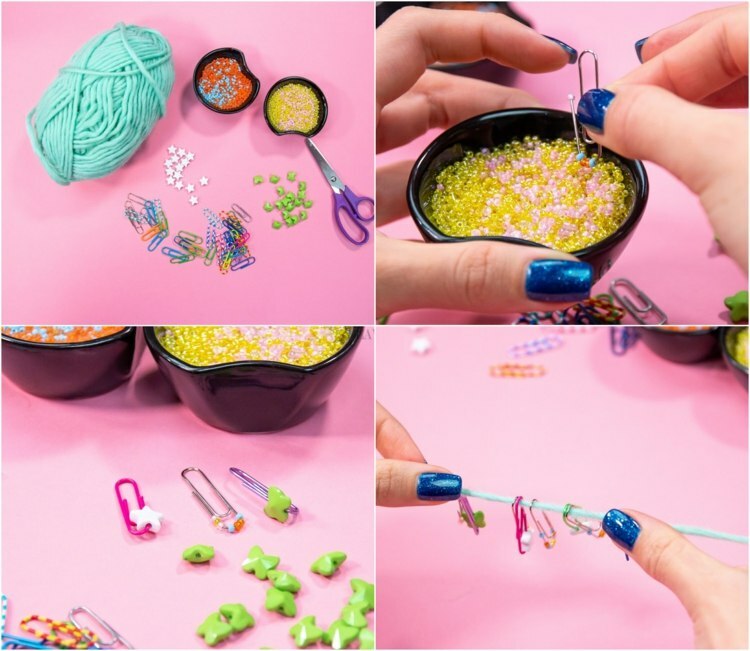 Decorate another clip with star beads and another with butterfly beads. 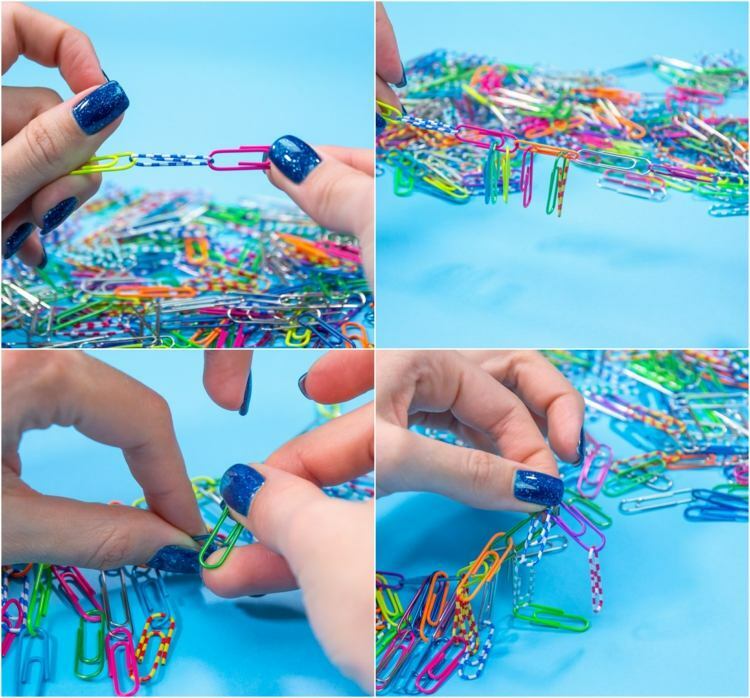 Decorate a total of 8 paper clips. Cut a long piece of yarn and thread paper clips. Tie the two ends of the yarn string. 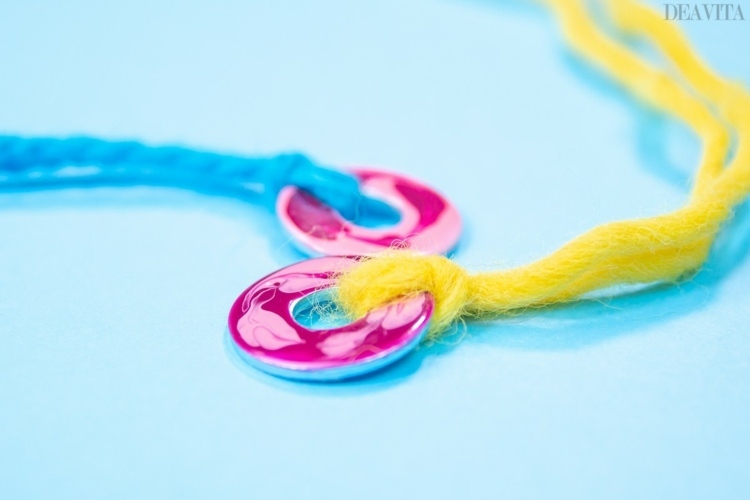 What do you think about organizing an exciting craft afternoon with your child and make a chic necklace? 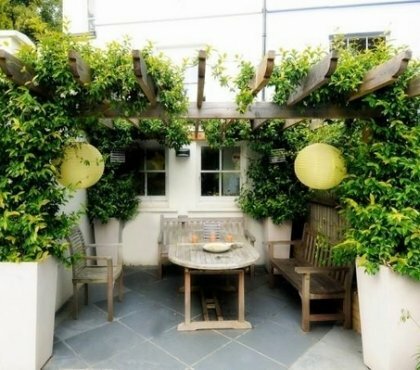 Even if you haven’t got beads, you will surely have pasts in the cupboard, which is ideal for the handmade jewelry. The only requirement here is that the noodles have a big hole to thread. 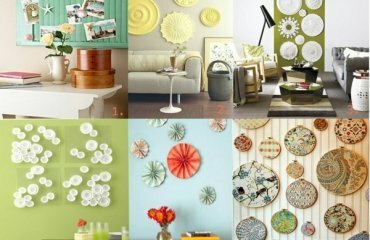 Paint the rigatoni with acrylic paint of your choice. 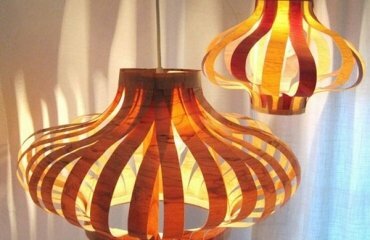 Use the wooden skewers as holders for the pasta. 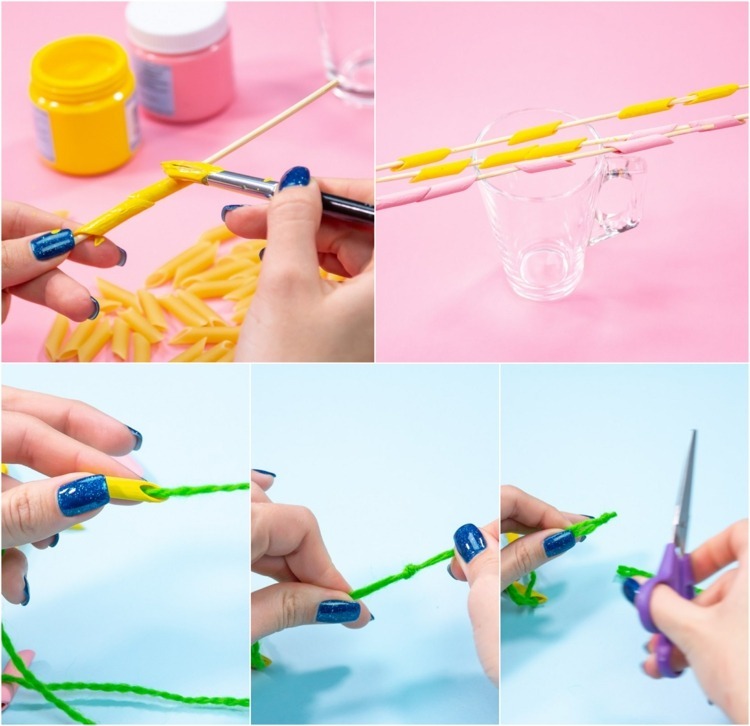 Then place the skewer with the colored noodles on a glass and let dry. 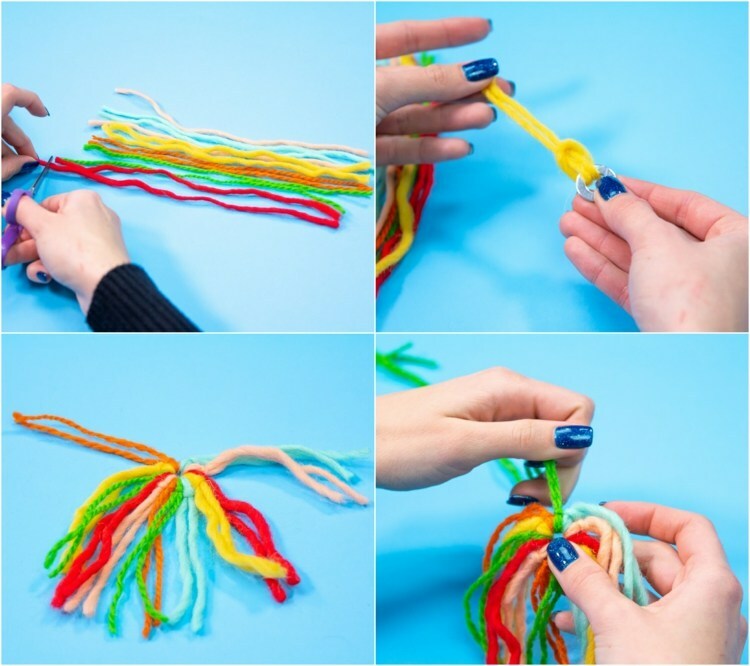 Cut off a string of yarn and thread the noodles. Tie both ends of the yarn and, if necessary, cut off the excess. 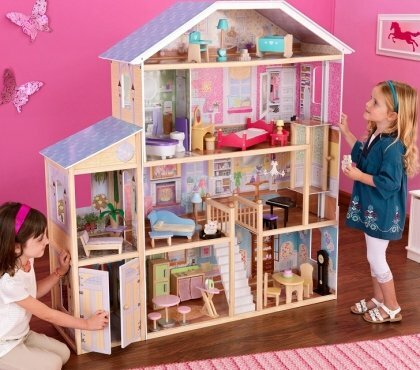 Children find everything that is colorful especially appealing. 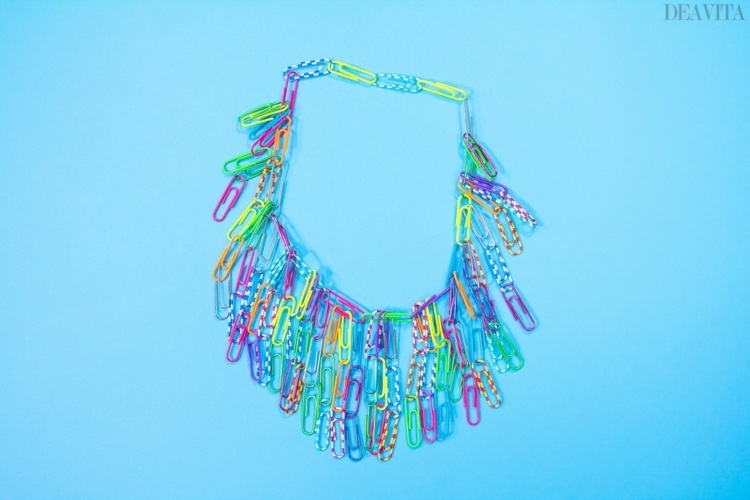 Craft a colorful necklace made of paper clips. 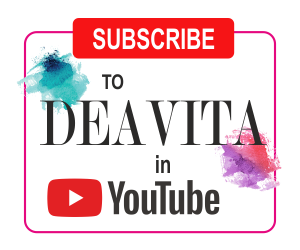 Just follow our instructions and create together a beautiful necklace that can be a nice accent to a monochrome dress. Link the paperclips together. 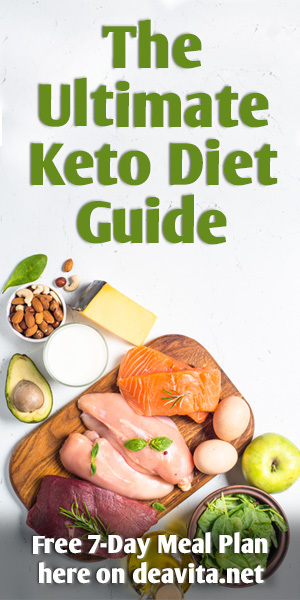 Measure the length of the chain. To make the pendant hang each clip, with the exception of the last two from each side, with 3 other paper clips pointing down. 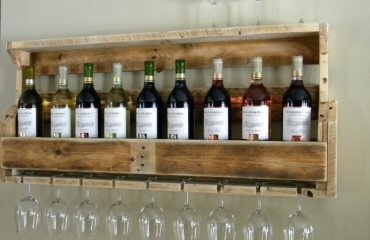 Then hang another 3 rows of clips. You can also make creative jewelery for children from various small mechanical parts, such as washers. With a little color they can be turned into great pendants. Place the washer on a piece of paper and paint it with nail polish in different colors. Let it dry. 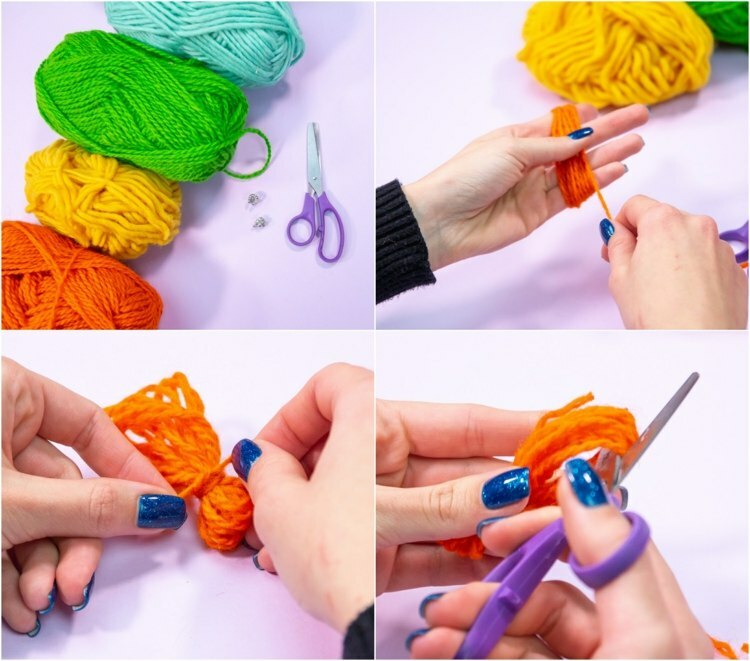 Cut off a string of yarn, fold it in two and thread it through the washer hole. Tie both yarn ends together. If necessary, cut off the excess yarn. 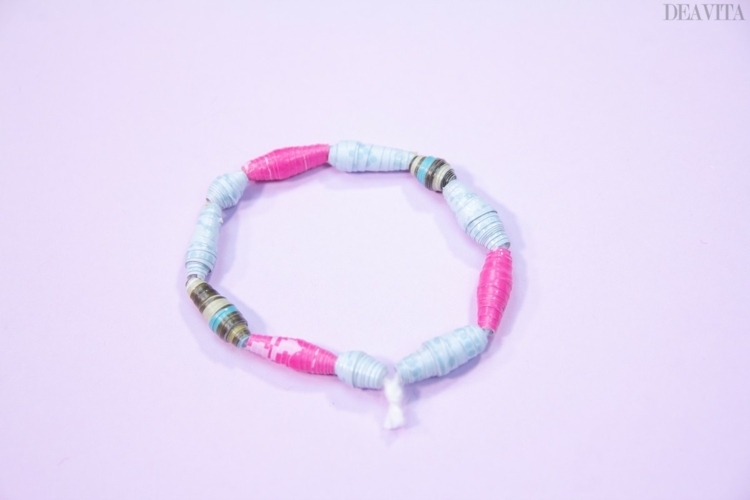 You can make an extraordinary bracelet with cute paper beads. The beautiful handmade bracelet can also adorn the hand of a toddler on a special occasion. 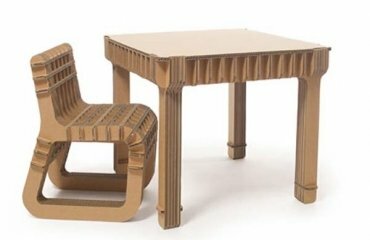 On a sheet of paper draw isosceles triangles with base 2 cm and legs 15 cm each and cut them out. Apply some glue on the inside of the paper and roll each triangle around the skewer starting from the wide end. Apply some glue to the finished bead. Let paper beads dry. 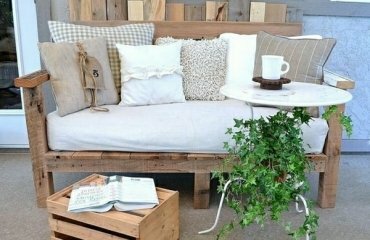 Cut off a string of yarn and thread the beads. Tie both ends together and cut off excess yarn. 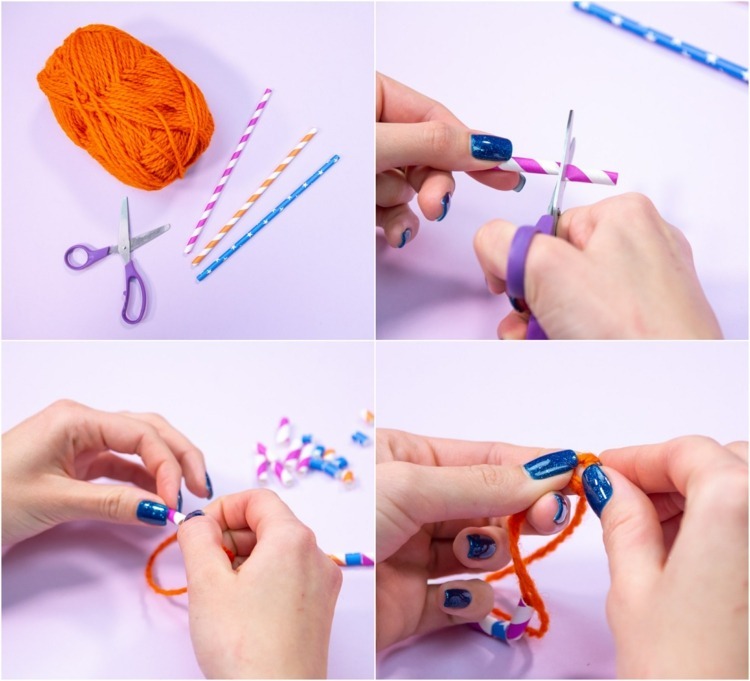 Cut the straws into pieces of various sizes and thread them on a string of yarn. Tie both ends together and cut off excess yarn. 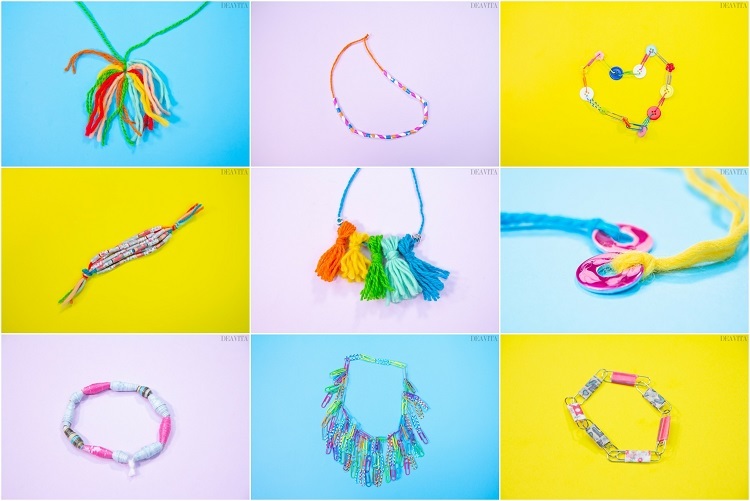 You can make an original piece of jewelry for a girl from colorful yarn. This colorful tassel necklace will add color into the cold winter days and give a good mood. Craft 5 yarn tassels as shown in the picture. 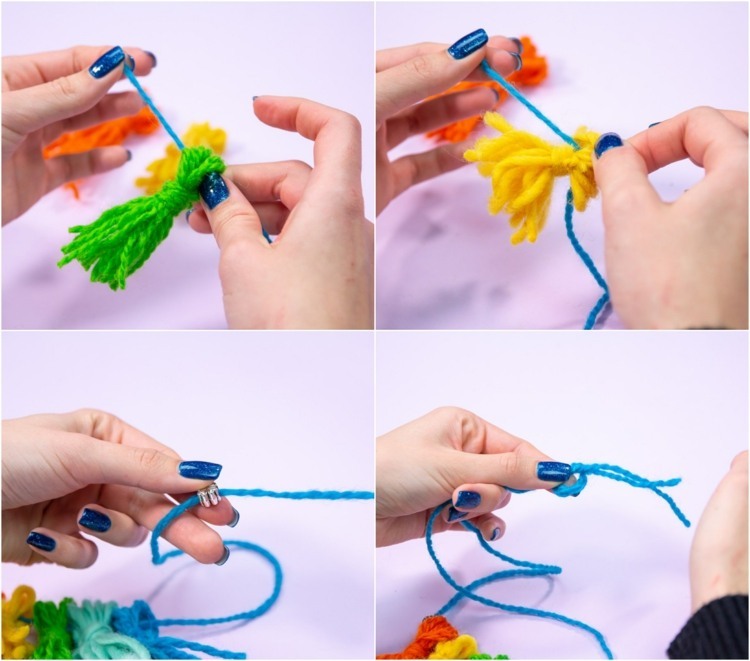 Thread the finished tassels to a string of yarn. Then thread a metal bead on each side of the string and tie the ends. 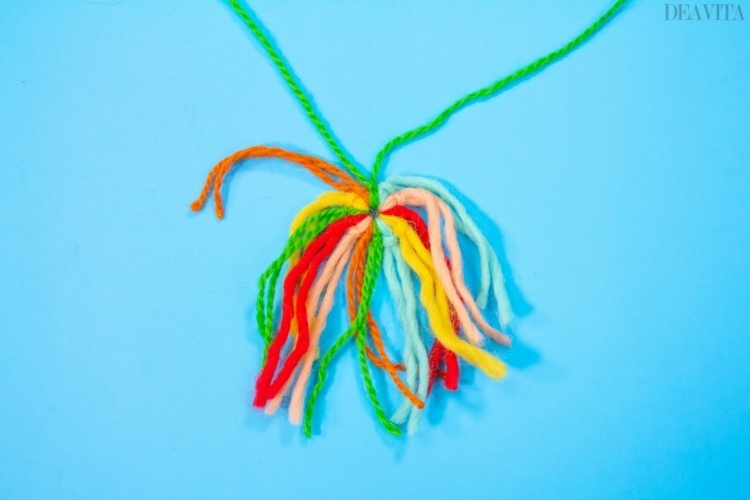 Cut a string of yarn from each color about 20 cm. Fold the wool pieces in two and thread them through the hole in the washer. 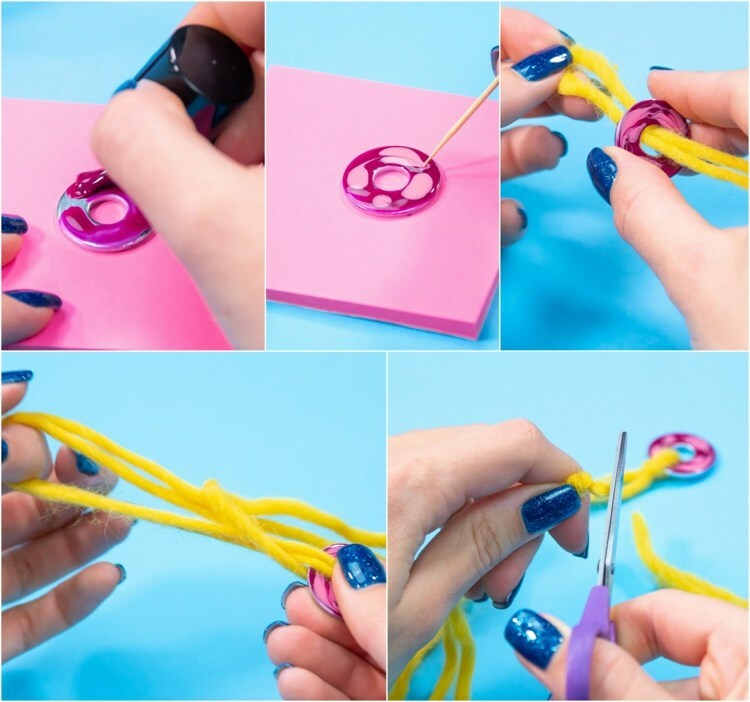 Tie the pieces of yarn to the disc to make the colorful pendant. Then cut another string of wool yarn about 60 cm long, fold it in two and thread it through the washer. Knot both ends.